﻿ Real Madrid 3-1 Liverpool. The Kings of Europe make history again! 26.05.2018 » Real Madrid 3-1 Liverpool. The Kings of Europe make history again! And just like that, Real Madrid won their 13th Champions League title, their 3rd in a row. Karim Benzema and Gareth Bale with a double delivered a major win to the Merengues. 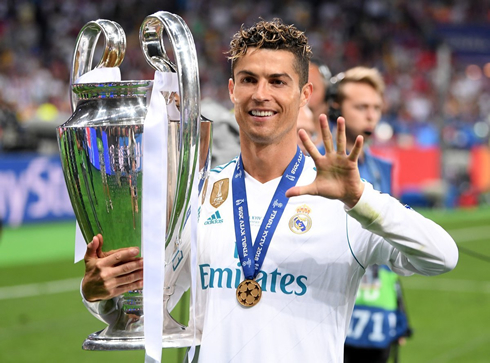 It's also the 5th UEFA Champions League that Cristiano Ronaldo wins in his professional career. 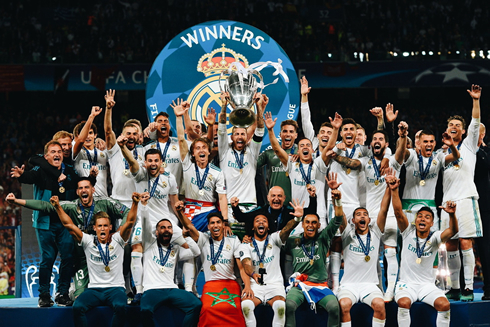 A historic night for Real Madrid in Kiev last night, as they became the first team in the modern Champions League era to win the tournament three times in a row after beating Liverpool by 3-1. It's been a truly magical run for Real Madrid and this season couldn't have had a better ending than this... 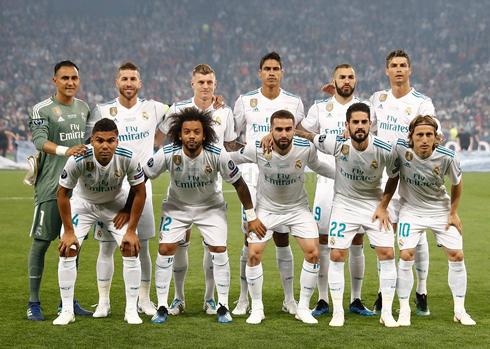 The match really felt like the end of an era, as the same core that has lead Madrid in recent years were again able to stay calm under pressure and deliver the Merengues yet another UEFA Champions League trophy. 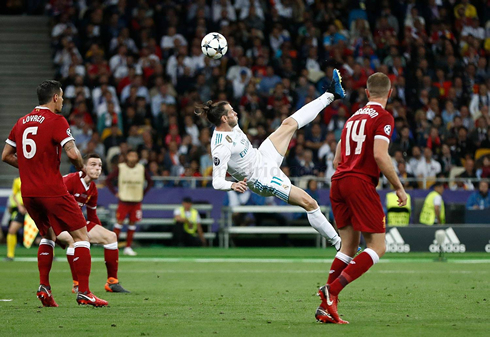 Prior to this game, all Champions League odds were suggesting that Ronaldo would be the man to watch in Kiev, but at the end of the day, it turned out to be Gareth Bale who made the difference in this year's final. Coming into the match, all the talk centered around Liverpool's front three vs Madrid's defense and it was clear that this played into Zidane's tactics. With Isco starting ahead of Bale, Zidane looked to play more defensively sitting back and absorbing pressure, not allowing Liverpool to play on the counter and exploit their speed on the wings. But in the application, it's not entirely clear if this worked. 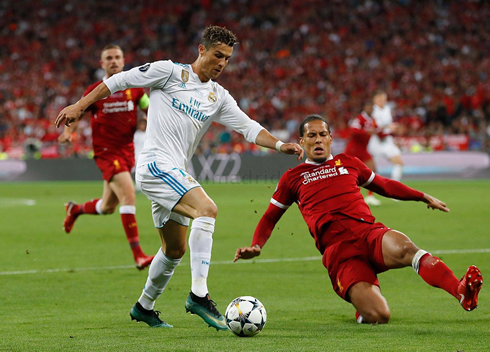 Madrid were constantly under pressure early in the match and while Liverpool didn't have any clear-cut chances, they certainly found themselves threatening the Madrid backline. However, the match changed 30 minutes in, when Liverpool's talisman Mohammed Salah went down with a shoulder injury after falling during a tussle with the Merengues captain Sergio Ramos. Off in tears, Salah's exit really changed the game and Liverpool were unable to threaten at the same level. Madrid would have their own injury worries as well. Dani Carvajal, only recently back, would go off in tears just a few minutes later with what appeared to be either a hamstring or Achilles injury. His World Cup could be in jeopardy. Liverpool seemed shellshocked without their star and Real Madrid could smell blood. Still, despite their dominance, Madrid were unable to score before halftime. And just like the last match in the Champions League against Bayern Munich, a goalkeeper error would blow the game wide open. Karim Benzema was alert and stuck out his leg as Loris Karius attempted to roll the ball to his teammate. The Frenchman deflected the ball and it ended up rolling into the back of the net. A horrific mistake for the German keeper, but Madrid were not complaining. Up 1-0 now and heading for the 13th. Real Madrid looked to kill the game off, but Liverpool would not go away and Sadio Mané was able to even things up pouncing on a ball in the box and knocking it past a helpless Navas. 1-1 on the scoreboard and perhaps the football gods were on Liverpool's side tonight. Then it happened. Perhaps the best goal in Champions League final history and that is no small feat. Gareth Bale came off the bench and made the kind of impact one could only dream of. As Marcelo floated a right-footed cross into the box, Bale, with his back to goal, inexplicably hit a left-footed bicycle kick into the top corner of the net. It was comparable to Ronaldo's effort vs Juventus earlier in the season and the Welsh fire-breathing dragon sprinted off in celebration. Madrid would cap the game off with another Bale goal and yet another mistake by Karius. A long shot from Bale looked to be a routine save for the keeper, but he fumbled the ball and it fell into the back of the net. Bale, with two off the bench and Madrid up 3-1. Full time would eventually come and Real Madrid could celebrate winning the Champions League three times in a row. What an achievement and what a match. For some diehard Madridistas though, the final was tainted with the comments of both Cristiano Ronaldo and Gareth Bale after the match. Both players indicated that this could be their last season with Madrid and while emotions are running high, who can really blame them? They've won everything with this club and if they are to leave, Madridistas can only wish them well and thank them for all they have achieved. More news to come in the following days but for now...Hala Madrid y Nada Mas. Three Champions Leagues in a row and the 13th is secured. Attackers: Isco, Cristiano Ronaldo, Benzema. Cristiano Ronaldo next game for Portugal is on May 28 of 2018 against Tunisia. You can watch Juventus live stream, Portugal vs Tunisia, Mexico vs Wales, France vs Ireland, USA vs Bolivia, and Italy vs Saudi Arabia, all matches provided from our football live game pages.